How do you say Thank You for the extraordinary amount of time and effort people take out of their lives to make a difference for our students, staff and community? The below is just a minor fraction of some of the many people who deserve thanks from PTSA Council! 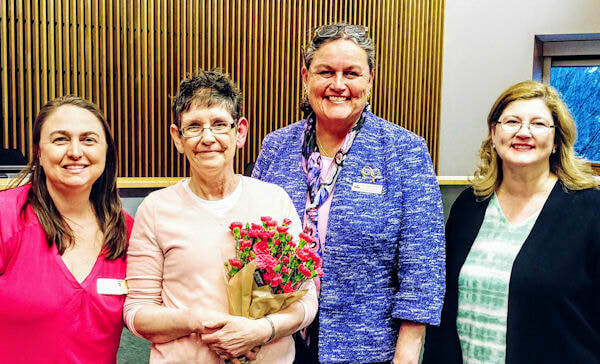 At Northshore Council PTSA's March 18, 2019 General Membership Meeting, vollunteer Sue Freeman was recognized for her many years of dedication and service managing the Northshore Community Kitchen! Pictured (from Left): Northshore Council co-President Grace Jurado, Sue Freeman, Northshore School District Superintendent Dr. Michelle Reid, Northshore Council co-President Carrie McKenzie. GREAT GRATITUDE to Sue Freeman, who organized and managed Northshore Community Kitchen operations on behalf of Northshore Council PTSA, dedicating years of service and care toward the program, its volunteers and those it served. MANY THANKS to local PTA leaders Jane Chiodo (co-President, Canyon Park PTSA) and Amber Rosenquist (President, Sorenson PTA) for presenting at the 3/18 Council meeting and sharing secrets of their PTAs' ongoing membership success. HUGE HOORAYS to Council Nominating Committee members, Sue Freeman, Nancy Chamberlain and Stacey Meyer, for their efforts finding and vetting prospective board members. We are so grateful for your work! THANK YOU to co-President Carrie McKenzie for for speaking on behalf of our Northshore PTSAs at the February 25th school board meeting. She gave shout outs to some local PTAs and shared information about upcoming parent education events. SHOUT OUT to VP East Melissa Kline for hosting the March 1, 2019, Coffee with Council event. MANY THANKS to Nancy Chamberlain and Robin Zaback for their work putting together WSPTA awards submissions on behalf of Northshore Council. MANY THANKS to Carrie McKenzie, Tricia Woods, Sherry Rudolph, Nancy Chamberlain, Marcilla Proudfit, Grace Jurado, and Robin McKenzie for speaking on behalf of our Northshore PTSAs at NSD School Board meetings this year. MANY THANKS to Council E-Prep Chair Robin McKenzie for his ongoing work to educate and advocate for the importance of emergency preparedness! He regularly hosts E-Prep meetings for PTA chairs across Northshore, he speaks at local PTA events and meetings to help educate community members, he is heavily involved with local organizations, and he is very active advocating for improved safety and security with the school district and beyond. In December, the Northshore Emergency Management Coalition awarded Robin the "Volunteer of the Year" award for his grassroots efforts to connect emergency management managers across regions and organizations to increase cooperation. Congratulations, Robin! GREAT GRATITUDE to this year's Council-level Reflections judges, including Kathy Greisen, Dru Solberg, Karen Oie, Susan Jackson, Erin Young, and Jill Enright, who put in many hours during the busy holiday season to judge all of the pieces. Also a big thank you to the Arts of Kenmore for use of their display panels during the Reflections Celebration event. THANK YOU to local PTA leaders Jen Moreau-Cook (Woodin PTA) and Denise Needs (Hollywood Hill PTA) for sharing their experiences and ideas at our January 7th meeting. It is so wonderful to be able to learn from each other! HUGE HOORAYS to Cindy Jensen and Stacey Meyer for planning, organizing and hosting an amazing Reflections Celebration for 270 Northshore student artists on January 12th. And GRATITUDE to the team of wonderful volunteers who helped make it an awesome event! THANK YOU to Melissa Kline for organizing and facilitating a networking event for Northshore middle school PTA leaders in November. MANY THANKS to Stacey Meyer for graciously hosting a wonderful holiday gathering for Council board members. A BIG SHOUT OUT to Reflections Chairs across Northshore. Your job as a Reflections Chair is big and often thankless -- but know you are supporting students who are often never celebrated for their creativity. You are making a difference!!! THANK YOU to Marcilla Proudfit for organizing and hosting the most recent Coffee with Council event on 11/9 and facilitating some great discussion with local leaders about FACE, fundraising and more. MANY THANKS to Sue Freeman and Michele Holowachuk for representing Council at a regional Family and Community Engagement (FACE) leadership meeting on 11/14 and working to strengthen our ongoing commitment to connecting with all families. GREAT GRATITUDE to all who attended the Presidents & Principals Luncheon on November 1st! Special thanks to event organizers Grace Jurado, Carrie McKenzie, and Stacey Meyer, the many volunteers who helped set-up and clean-up, as well as to Bothell High School's Culinary Arts students for preparing a tasty lunch, and featured speakers Jen Hirman and Cristina Marquez. BIG HOORAYS to ALL of our awesome Northshore PTA/PTSA delegates who attended Legislative Assembly, including Council delegates Carrie McKenzie, Robin McKenzie and Marcilla Proudfit. We are so grateful for your work on updates and additions to our legislative platform and for advocating for all children! MANY THANKS to Nancy Chamberlain and Charla Griffy Brown for organizing the Candidates Forum on October 1. CHEERS to Marcilla Proudfit for organizing and leading our first Coffee with Council event on October 4. Much gratitude to Aaron Moreau-Cook for his service with Northshore Council PTSA over the last year as Area VP East. Due to family and career commitments, he has resigned. He will be missed at Council and we wish him all the best for the future. Many thanks to the Region 6 Service Delivery Team and WSPTA leaders who provided training for Northshore PTA leaders after the general meeting on 9/17, including Sue Freeman, Cindy Jenson, Grace Jurado, Janice Kutzera, Monika Scotti, and Robin Zaback. Thank you to Council Vice-President Carrie McKenzie for representing Northshore Council and our local PTAs at the NSD School Board meeting on August 27th and for raising awareness about immunizations. Gratitude to Marcilla Proudfit and Robin Zaback who represented Northshore Council and our local PTAs at the NSD Back-to-School Fair on August 15th! Many thanks to Rachel Northquist, Tricia Wood and Robin Zaback for serving on Council's End-of-Year Financial Review Committee! Stacey Meyer for putting together such an amazing dinner WSPTA convention. Sheryl Wilkins for running the Northshore College Scholarship Program the past 3 years. Jane Flaherty and Cindy Jensen for being on Sheryl's team to review the scholarship applications. Dr. Reid - for being flat out AMAZING and going to everything in the district! Corina Pfeil for testifying for WSPTA for Breakfast after the Bell - HB1508 passed the House on March 3! YES! Nancy Chamberlain, our President, for being our voice with the school board and making a difference. Cindy Jensen for running another Reflections celebration - close to 600 people showed up. Grace Jurado for keeping our books in order and filing all our reports (taxes, corporate renewal and more. To David Cogan, Ken Smith, Sandy Hayes, Amy Cast and Kimberly D'Angelo for your countless hours you dedicate to students in our district, showing up at Focus Day and being involved. We see it and you are making a difference serving on our school board. Carrie McKenzie for taking an extraordinary amount of time to submit our Council for a National PTA Advocacy Award. Janice Kutzera (WA State PTA Finance Officer) and Sherry Rudolph (Reg. 6 Director) for helping collect the 300 pieces of Reflections art, sorting it and double checking it! 15% increase in pieces this year! Sue Freeman for running our Community Kitchen (learn more and even watch the video) in partnership with the YMCA. Not only do we support local families in need by providing them with an organic meal each week, Sue partners with many local businesses. A big shout to Village Wines of Woodinville, Proven Bread and Farms for Life. They are so generous and as Sue puts it "the backbone of our weekly meals. Tianna Jiles for getting us all excited about Leg Assembly and guiding us! Corina Pfeil for her amazing determination and coordination to pull together the OSPI coffee social event with Erin Jones and Chris Reykdal. Northshore School Board - for your being open, listening and letting PTSA have a voice.